← Where to teams stay when they play the Colorado Rockies? 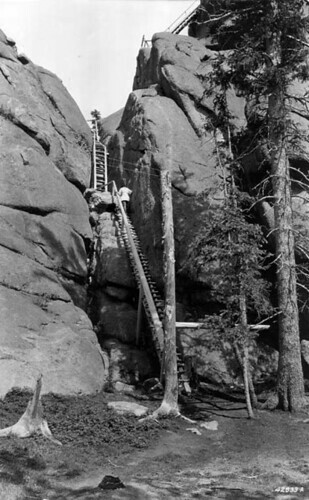 Caption: Ladders leading to observatory, Devil’s Head Fire Lookout, Pike National Forest, Colorado. Miss Helen Dowe, lookout season 1919, climbing first ladder. Photo is from the Forest History Society Photograph Collection. To browse other Forest History Society photo galleries, click here. To see information on obtaining high-resolution images, click here. This entry was posted in Colorado National Forest and tagged Devils, fire, head, Lookout. Bookmark the permalink.